WANDERERS coach Tony Popovic has sensationally quit on the eve of the A-League season to take up a club job in Turkey. Just a week before Western Sydney's first game of the season, Popovic resigned yesterday morning to become head coach at Karabukspor. The club is third from bottom of the Turkish Supa Liga, having won just one game in seven this season. Having turned down a succession of offers from Asia and England, Popovic has decided to seek a new challenge after five seasons at the Wanderers. 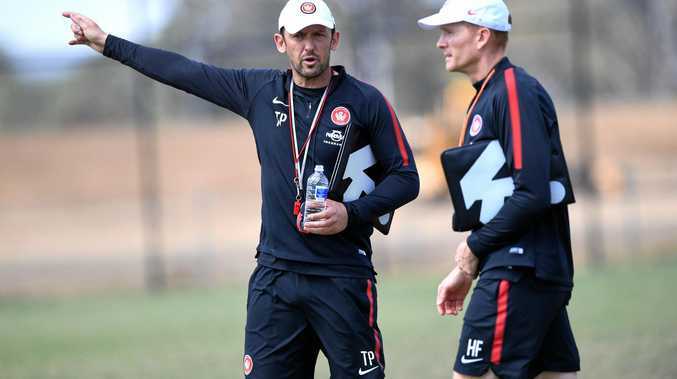 It throws Western Sydney's plans for the new season into chaos, and comes ironically after Popovic had hailed the recruitment and planning that he said had given the club its most settled pre-season. The club will have to move quickly to find a successor, with Socceroos assistant Ante Milicic - who was Popovic's No 2 at Western Sydney in the club's first season - certain to figure prominently in discussions. Though Popovic had several years to go on his contract, it was always believed that he had a handshake agreement in place with Wanderers chairman Paul Lederer to leave if the right offer came along. His decision means Popovic leaves the A-League without having won the championship, despite having steered the club to the grand final three times. Remarkably Western Sydney won the Premier's Plate in its first season, and a year later in 2014 stunned Asian football by winning the Champions League. But defeats in the grand finals of 2013, 2014 and 2016 had seemingly left Popovic determined to win the outstanding title, with a squad this season that on paper appeared better equipped than ever.